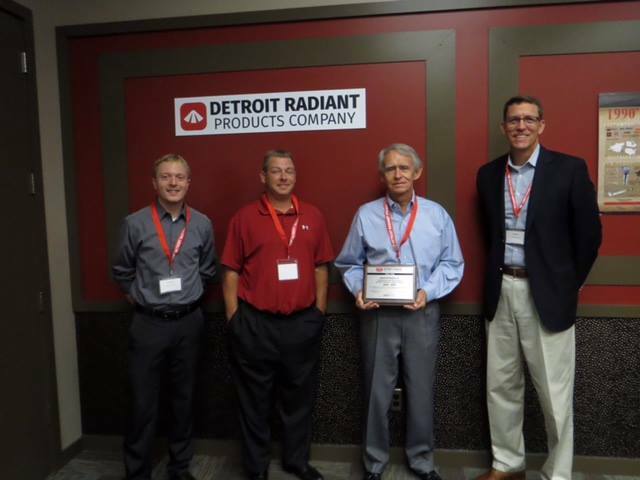 At Industrial Radiant, we are proud of 40 years of service and look forward to helping you to find a solution to fit your needs. Industrial Radiant, Inc. is a family-owned small business founded by Robert Cleland. We are a manufacturers’ representative for various manufactures and specialize in designing infra-red heating layouts, HVLS Fan layouts and LED lighting layouts for industrial and commercial buildings, such as, automotive shops, airplane hangars, car dealerships, manufacturing facilities, various agricultural situations, restaurant and residential patios. We are equipped to handle every aspect of the design process for architects and engineers and can assist all the way through the installation phase. Industrial Radiant, Inc. has two primary product lines, the first is Detroit Radiant Products who owns the Re-Verber-Ray brand that we have all come to know and love and the second being SkyBlade Fan Company, where form follows function. Industrial Radiant offers a wide range of products, everything from infra-red heaters to LED High/Low Bay lighting and HVLS Fans to evaporative coolers. Our staff, from sales personnel to our office staff stay up to date and professionally trained to accommodate our customer’s needs and provide the best solution possible. Our main office and warehouse are located in the Dallas – Ft. Worth area, where we stock a variety of products and parts. We welcome new challenges, so if you think you have an unsolvable situation, call us to solve it for you! We at Industrial Radiant, Inc. pride ourselves on being honest and providing quality and dependable customer service. Our motto is doing it right the first time saves you time, money and headache in the long run. Needing a quote on your project?